Quote: Ten years ago, a child wished for the destruction of the world. Now, a group of people has the ability to grant their wishes depending on their power. They are called "Order User." Before these great people who have the power of "Order," one person excels the most with the ability to rule and conquer the world and turn people into puppets when it is in his jurisdiction. This power belongs to Hoshimiya Eiji, who is also responsible for the destructive phenomena that happened exactly ten years ago. Somehow this anime similar with Code Geass: Lelouch of the Rebellion (Code Geass: Hangyaku no Lelouch) with the story and character overlapping with each other. How? Within the early story development main characters meet with fairy like companion which grant wish, and the main character obtain power to order others without regard to their will. Main character fight against the world and also have little sister with sickness to protect, with father as the enemy. Coming from Lantis, it is not much of a surprise that the art and sound are well done. The character are normal, yet good enough. If you enjoy watching supernatural or fantasy battle you will like this one too. Though don't expect too much. So far i enjoy the music which enhance further the enjoyment as you watch the series. OP & ED is good enough to fit with the story. All of the characters seems rather ordinary. 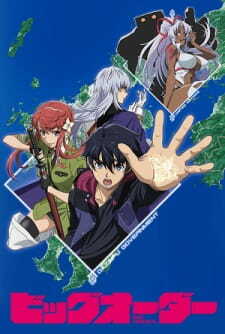 Seems like a ripoff from the anime which had been aired like Mirai Nikki on the early and Lelouch later on. Character development is good but could be done better. So far so good, I just wait to see the ending. Overall, this anime does not try to be anything out of the ordinary, you would be able to enjoy this without expecting too much.